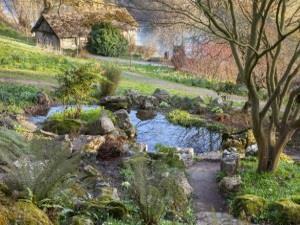 The Weir Garden01981 590509work GardenEscape to this spectacular riverside garden and be absorbed by natural beauty. Bordered by the River Wye, The Weir sits within unspoilt Herefordshire countryside and has many historical secrets to uncover. For centuries, this site has been used as a pleasure ground for fishing, boating and swimming. It is managed in a natural way to create a varied habitat for wildlife. In spring, see carpets of bulbs littered between ancient trees; in summer enjoy a picnic by the river to watch the wildlife and in autumn visit the walled garden bursting with seasonal produce. Visit the garden any time of year to find out why this location has appealed to so many and enjoy exploring this tranquil haven. Please note: only assistance dogs are allowed in the gardens, all other dogs can be exercised in the car park picnic area.